Grind all the ingredients for pesto in a blender to a paste and set aside. Meanwhile assemble the sandwich as follows. 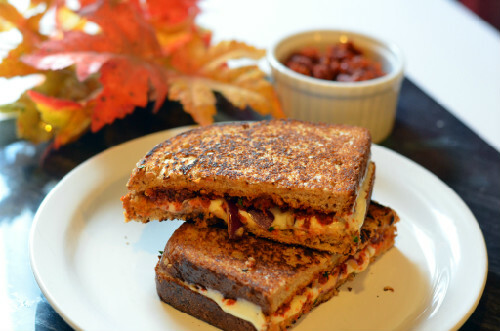 Apply the tomato pesto on the bread, arrange with sliced onion and top it off with mozzarella slices. Then cover it with another slice of bread. Once the pan is medium hot, reduce the flame to a little lower than medium and place the assembled sandwich on it. Grill for 2 mts on each side or until the crust is golden brown and the cheese is melted. Remove and serve it with tomato soup. It was very yummy, Sowji. I liked the Pesto you gave me last night. Will have the same for dinner tonight as well. Thank you. Thanks prabha. glad you liked it.